I have a Sinningia Bullata which does not get any direct light. It gets afternoon filtered light from a west facing window sill. I bought it potted in a glass vessel using moss instead of soil. The pot is not drianed but it keeps well drained from the moss. Recently it has developed brown spots on the leaves which looks like rot. I’m afraid to cut the leaves as I don’t know what will happen. It has never flowered (in 2 months) but that does not matter to me as I love the unique look and texture of this plant. Do you have any care tips which may help me maintain a strong and potentially blooming plant? The spots might be from water drops that precipitated on the leaves. I’ve gotten brown spots on the leaves as well after accidentally spraying the plant with water. You can wait out the leaves to fall off naturally if that’s the case. If it looks more serious you can try spraying it with fungicide. In my experience fungicide does further damage to the leaves and they might fall off or you can try and rinse the fungicide an hour after the application to prevent further leaf damage. You can also make your own spray dissolving baking soda in water (the high pH disrupts fungal infections, since fungi like acidic conditions). Keep in mind that getting baking soda solution onto your sinningia bullata’s roots might be disastrous, since the plant likes acidic conditions. If you have a tuber formed at the bottom of your plant you can pretty much cut off the whole leafy part (and root it since your plant hasn’t started flowering yet) and new shoots will sprout out of the tuber shorty after. So don’t feel bad about removing a few leaves if you must. Running low on certain nutrients (mostly K) will makes your plant more susceptible to diseases like rot, and sometimes simply re-potting it solved the problem. If your leaves were browning at the tips I would suggest higher humidity and a humidity tray, though I don’t think that’s the case with your plant. Depending on how big your plant is, it might be just a matter of time before it starts blooming (sometimes it takes couple of years for the plant to reach blooming size). You can also try slightly higher light levels, maybe an hour or 2 direct morning/late afternoon light will be sufficient to induce blooming (that might help with the fungal infection as well). My best advise would be to make cuttings while you can. Once it starts blooming it seems impossible to propagate it. If you have just a few spots on your leaves you can definitely make cuttings and ignore the spots. That way you can try different conditions and see what works best. If there are a lot of spots, it might be better to just cut off and throw away the infected parts. I’ve made it a standard practice to propagate plants as soon as I acquire them. That way I always have a back up with my new plants, and can experiment with my conditions. I hope this was helpful. If you’re not sure which way to go with your plant you can always send me a picture of it, maybe I’ll be able to help out more. I just bought a Sinningia bullata plant. It has bulb (slight brown colour stuff, like a mushroom) above the soil, leaves come out from the middle of the bulb and round 4 inches high. 1. how to do the Propagation? Is it to cut the leave part with part of the bulb and replant it in new pot? 2. When I water the plant, should I water the bulb or the soil? 1. You can try to root a cutting. You cut off a small branch. Best place to cut it is about half an inch under a node (node is where leaves can come off from the sides of the stem), then remove the bottom leaves leaving 1 or 2 leaves at the top of the cutting. Dipping the bottom of the cutting in rooting hormone before putting it in water or moist soil to root will definitely help. I have not tried to cut a piece off the bulb, it might cause the bulb to rot. If your plant is flowering size, rooting cuttings wont work. You’ll have to propagate the plant through seeds. 2. Definitely water the soil. The bulb stores water and nutrients for the plant, so S. bullata can take occasional neglect. As long as the bulb remains healthy the plant will be able to recover from all sorts of issues. Watering the bulb directly, cutting it, or covering it with soil, all can lead to the bulb rotting, so I would not recommend it. I am not sure If I could manage cutting a piece of the bulb with a growth on it, without killing the original plant (getting the bulb to rot for example), but I think I might try it, since I have a spare S. bullata. I’ll let you know if I make it work. I just bought the Sinningia Bullata and I’m a bit confused with the care and watering. I was wondering how often you water your Bullata plant? The nursery where I bought mine said to water once a month while other websites have said once every 3 months. These websites mention other types of Sinningia plants though so I’m not sure if the care instructions can be applied specifically to the Sinningia Bullata. Also, I was wondering if you feed your Bullata plant or if it is necessary? If so, what kind of feed would you recommend? The watering needs depend on many factors: what type of soil your plant is in, size of the plant, how humid the environment is and so on. I would generally recommend making sure there is enough humidity in the air and waiting till the plant is fully dry to water it. Pick up the pot and if it feels very light (it will be easy to tell) then it’s time to water the plant. That would be the best way to figure out how often to water your plant. Better to dry it up a bit too much than over water it (if you dry it out you still might recover it from the bulb, but if you overwater it and the bulb rots than it will be much harder to recover the plant). I let my plant fully dry and soak it for a bit. I do feed it african violet fertilizer at 1/4 of the recommended concentration. Keep in mind that nurseries usually manage to keep the humidity very high. I personally water my plant about once every week to 2 weeks depending on the season, because my humidity level is somewhat on the dry side and my plant dries out fast. I grow this plant in Sydney, Australia, outside in a shadehouse. It does well in a hanging basket as an alternative to a pot, the basket turning the “legginess” into an asset. I have finally rooted cuttings from a flowering plant – I find I have to try 6 or 7, preferably new shoots coming from the tuber, just to get one to root. I think if the shoot has never flowered, there is some chance of success even if older shoots from the mother plant are flowering/have flowered. I use long-fibre sphagnum moss as a medium, lots of rooting hormone, terrarium conditions (eg in a pot inside a plastic bag) and put the cuttings over a heat mat, even in our friendly climate. It still takes ages – and most die. This is a lovely article about an outstanding plant – and I would agree with Vesi – cutting into the bulb sounds too risky. Hi I am interested in trying to grow some from cuttings from my plant ( which has NOT flowered). Try taking tip cutting that includes at least 2 nodes (wider part on the stem where new growth can come from), and remove any leaves from the bottom node of the cutting. The bottom leafless node of the cutting is where roots can start growing. You can either “plant” the cutting in moist moss in an enclosed container with high humidity (I use ziplock bags or glass jars), or put it in water. Hope this helps! Let me know how it goes :). I have a sinningia bullata in Sydney Australia, it is indoor in a very light room. It just has one stem and has had one flower. It looks very healthy but is getting very leggy and leans, should I support it in some way or should I cut some of the stem. Will it only grow new shoots from the bulb or will the stem produce more shoots on it. You can do either. I would suggest trimming it a bit (a tad bit above a node), and moving it to where it gets a bit more light, or closer to the window. The plant can branch out from the stem too. You can also support it and wait for new growth before trimming the leggy stem. 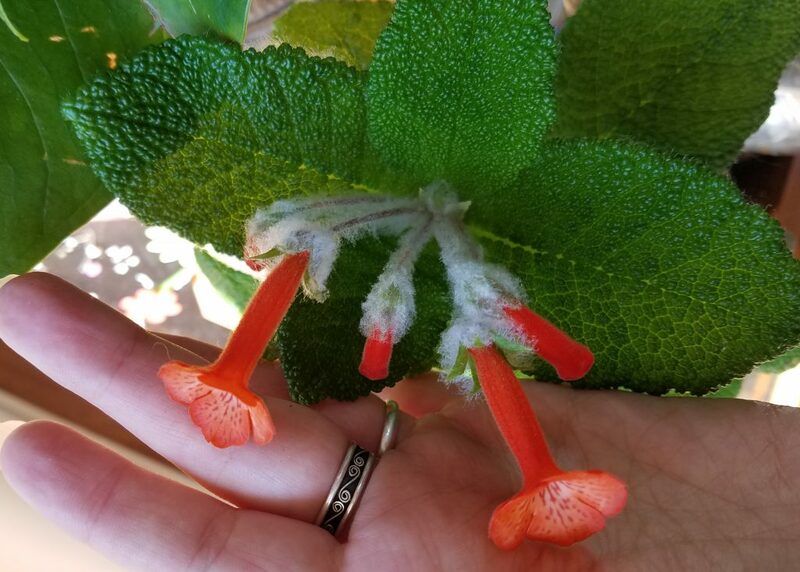 I have this plant and it was flowering when I bought it but has not since. It has grown quite large but hangs down over the pot, like a hanging basket. Should I trim it or let it keep growing? It is quite healthy. In my experience, it seems to flower on new growth. Trimming it should encourage a better and denser-growing plant and more flowers.